Kia has given the Cerato a generous GT makeover. 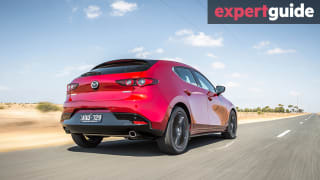 If you’re looking for a practical family hauler that offers a sporty drive - and a hot hatch is outside your price range - then I have some very good news. 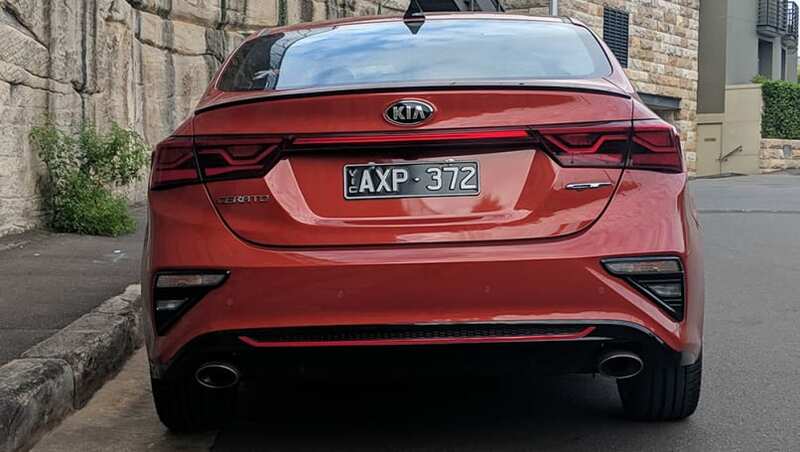 Kia has given the Cerato sedan and hatch a generous GT makeover, gifting it with more power and sporty styling touches throughout. 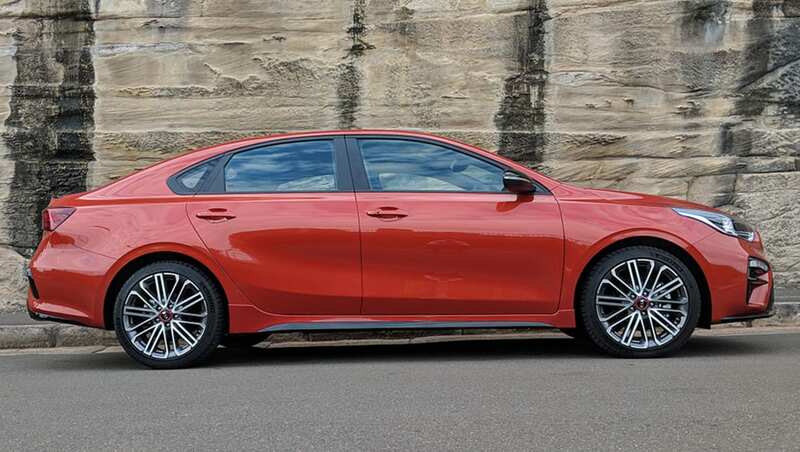 For my weekend test I drove the Cerato GT sedan 2019. A practical family hauler that offers a sporty drive. The Cerato comes with all the trimmings. Priced at $32,990 (before on road costs), it comes with all the trimmings - including an 8.0-inch touch screen with Apple CarPlay and Android Auto, digital DAB+ radio, Bluetooth connectivity, sat nav, wireless phone charging, a 4.2-inch digital instrument cluster and an eight-speaker JBL sound system. So, what’s this small sporty sedan like to live with as a family hauler? My kids and I had the weekend to find out. Our Saturday schedule included a trip into the city for present shopping, followed by various trips to birthday parties in the afternoon. The Sunset Orange (a $520 option) paint and the numerous exterior design features combine well to give the Cerato GT the air of car that means business. 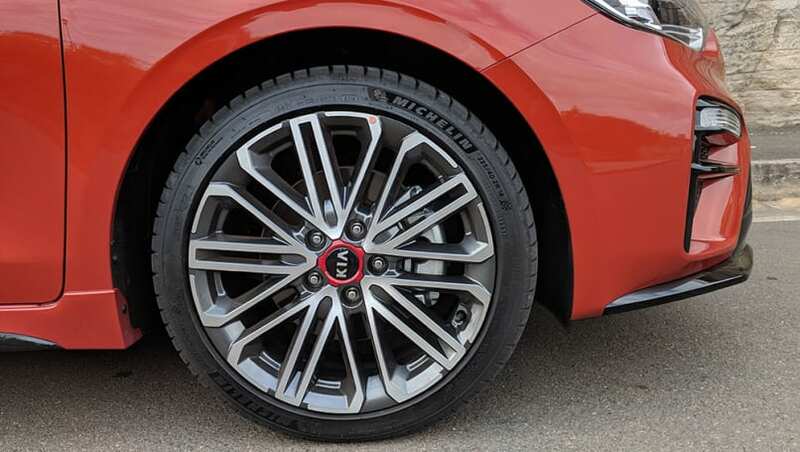 Sitting on 18-inch alloy wheels wrapped with Michelin Pilot Sport tyres, it’s noticeably lower and sportier looking than the other Cerato variants. Sitting on 18-inch alloy wheels wrapped with Michelin Pilot Sport tyres. The rear of the car features a narrow black-gloss spoiler, twin exhausts, and LED tail lamps. All up, it’s a good looking car with enough kerb appeal to turn the odd head or two. 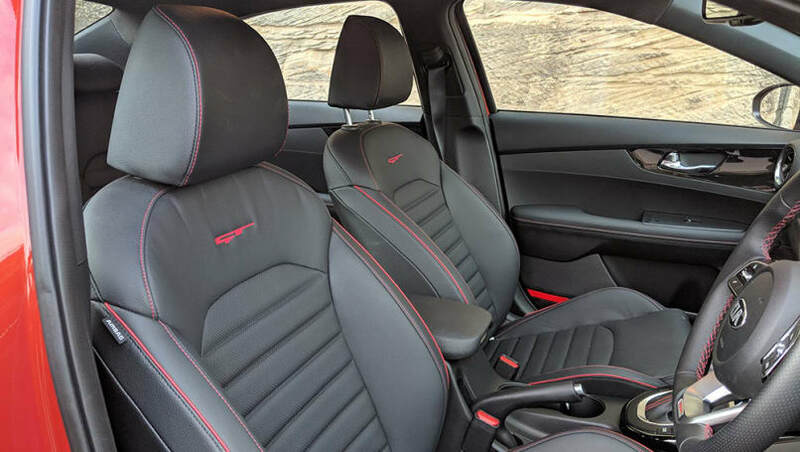 There are a plenty of nice GT touches in the cabin, too, with red stitching everywhere you look, from the leather seats to the gear lever and the arm rests on each of the four doors. The red GT letters sewn into the front seats don't look out of place either. Additional sporty features include alloy sports pedals and a flat-bottomed steering wheel. The rear of the car features a narrow black-gloss spoiler, twin exhausts, and LED tail lamps. 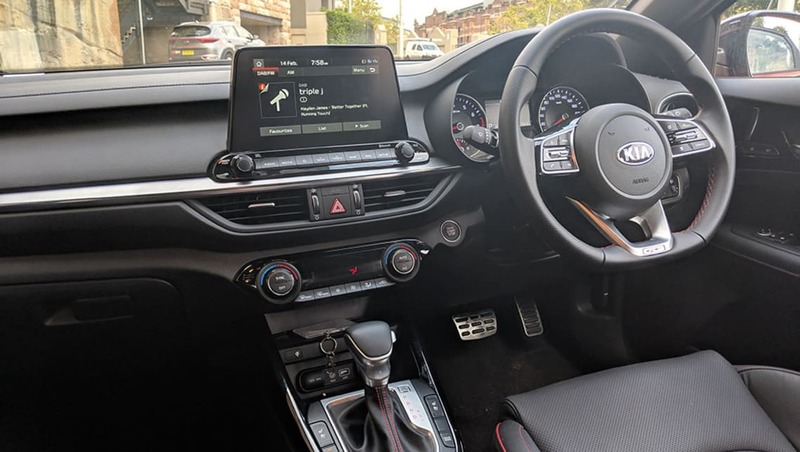 As for comfort features, there’s dual-zone climate control, as well as heated and ventilated sports leather seats with the driver’s being eight-way adjustable, a proximity key and push-button start. The 8.0-inch touchscreen display poking up from the dash has a decent quality and, as my three kids discovered, is super simple to navigate your way around. If you’d prefer, you can plug in for Apple CarPlay or Android Auto. The other features and functions within the car can be operated via a variety of tactile buttons and dials, which also deserve a big tick. There’s an impressive amount of head and legroom in the rear, with at least a hand-width of space between my knees and my driver's seat, and two or three fingers above my head. Additional comfort features include rear air vents to help keep things cool if you’re ever carrying three adults back there. For my two kids, however, there was plenty of space to make use of. There are a plenty of nice GT touches in the cabin. The schedule today involved a Woolies' shop in the morning and then a soccer trial for my son in the afternoon. 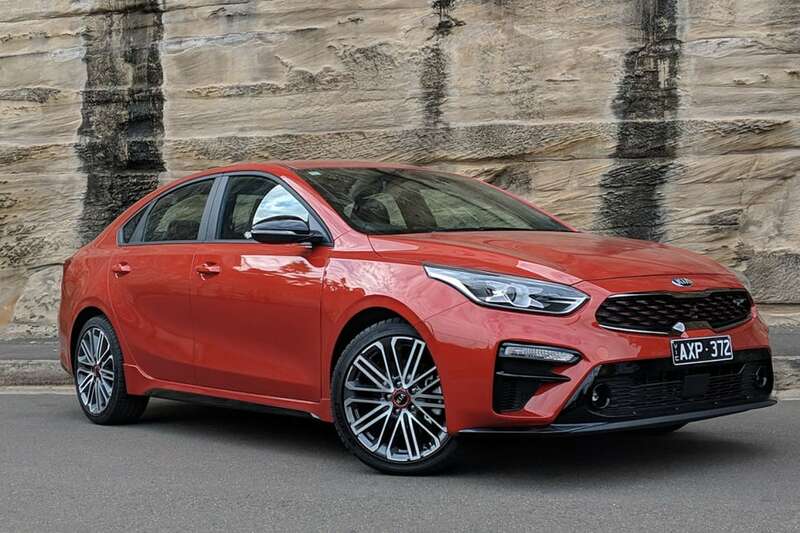 Under the bonnet, Kia has given the Cerato GT a more powerful 1.6-litre turbo-petrol four-cylinder engine producing 150kW and 265Nm. 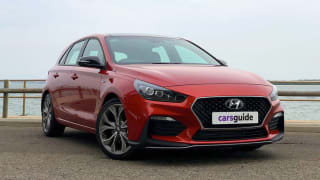 Interestingly, it’s the same engine used by the Hyundai i30 N-Line. Unlike the N-Line, though, the Cerato GT is only offered with a seven-speed dual-clutch automatic transmission. Off the mark, the GT launches with a sense of urgency that dissipates a little too quickly under continued acceleration. It was great fun on short hops around the city, though, displaying plenty of nimbleness and agility around narrow streets. Bouncing through the suburbs, the firm ride became more apparent and did little to cushion the numerous speed humps and road imperfections. On the flip side, the suspension set-up is perfect for taking on twisty roads, with the type of grip and hot-hatch-like handling that gives you plenty of confidence around the bends. 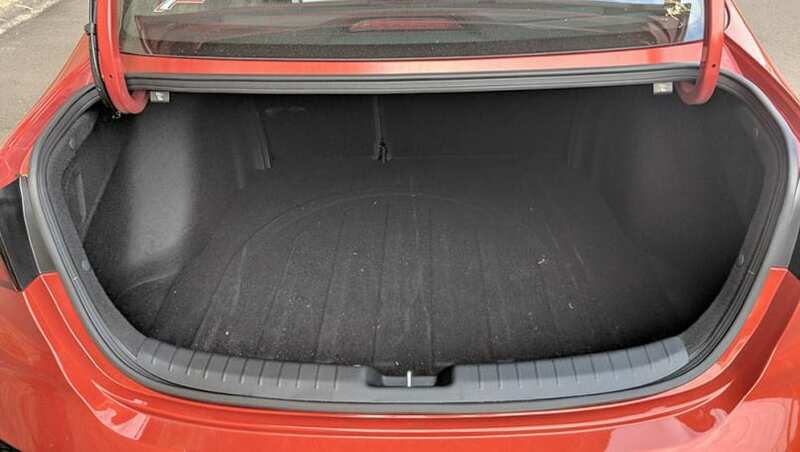 Kia has provided plenty of storage throughout the cabin. 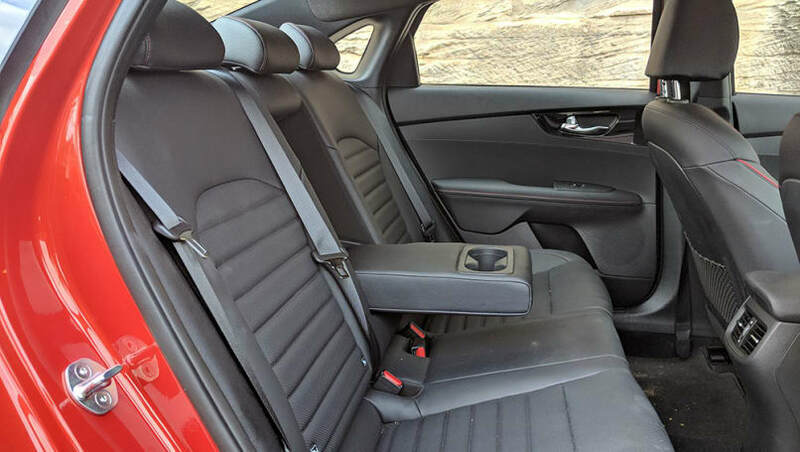 Kia has provided plenty of storage throughout the cabin, with two cup holders in the fold-down armrests in the back row, plus two more up front. There is a decent centre console bin and a hidey hole in front of the shifter, one of which is for wireless charging, and bottle holders located in each of the four doors. Boot space in our sedan was a generous 502 litres, which easily swallowed all our gear over the weekend. It also happens to be 74 litres bigger than the hatch boot. The Cerato GT scored the maximum five-star ANCAP rating. Standard safety kit includes AEB with pedestrian and cyclist detection, blind-spot warning, rear cross-traffic alert, adaptive cruise control and lane-keeping assistance. Boot space easily swallowed all our gear over the weekend. Parents with child seats will find two ISOFIX points and three top-tether anchor points across the rear row. We covered around 300kms of urban and city driving, with the trip computer displaying a fuel consumption reading of 8.3 litres/100km. Kia says that after a combination of open and urban roads, the GT should use 6.8L/100km. The GT only requires regular unleaded. The Cerato GT sedan is a good looking car that offers an entertaining drive that might even give the odd hot hatch a run for its money. It scores well on the value for money equation, but given its firm ride it might not make a great choice as a family taxi. However, if you are in the market for a small sporty sedan, this car is definitely worth considering. Would this sporty sedan work for your family? Tell us in the comments below. 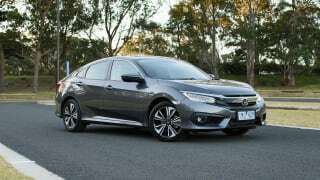 There was once a time where you would have been laughed at for saying the Honda Civic is actually a nice long-distance tourer.